But before we start, I want to note that Rev2 isn’t something I’m well versed in. It’s honestly probably the part of the core series I know the least about. I’ve not read any of the files scents it was first released and all I can remember is Barry’s Email to Chris File. I did check the translations of BIOHAZARD REVELATIONS 2 ULTIMANIA on Project Umbrella but saw nothing on Glasp. So do take this with some salt as it may be contradicted with a future translation. Unlike some of the other BOWs in Rev2, the Glasp seems to be the most well thought out and everything it does can be easily explained. However I’m sure this is a mistake on Capcom’s part because this is the same game where packs of “zombie dogs” run around with bear traps for teeth. But that aside, let’s for a moment remember that BOWs are just manmade animals. And animals have two, as fare as this post is concerned, main goals. Which is to survival and reproduce. Something that we can observe the Glasp doing. We see them turning invisible to help in survival and we see them reproduce. But the real question is, how do they do it? Well the Glasp adults turn invisible buy omitting what I believe to be some type of gas that messes with how light reflects around them. Two things make me think it’s a gas. The first is the adults have these big lumps on their backs with holes in them. I believe this is where the gas builds up and gets released. The second thing is the mass of the Glasp, the wings alone can’t support their size. So I believe that same gas helps them float and the wings just help them maneuver around more. The wings would also allow the gas to be pushed out into their surroundings. I believe the gas messes with how light is reflected because the distortion effect we see in game and Barry see in his vision when he first gets near one. As for how the gas forms in the first place, I can only guess it’s something to do with how the Glasp digestive or excrement works. Now what about reproducing? Well the Glasp are most likely asexual. If you look closely at the body of the Glasp, you’ll see a human face on the back of its head and just below (well above maybe the better word) that you’ll see a pair of female breast. That tells us two things, there’s human DNA within it, and it’s definitely a female that has the ability to produce egg cells. Some animals, like the Eagle Ray and Zebra Shark, can give birth when no males are around in a process called parthenogenesis. In the outcome of this process, the DNA of the offspring will be identical of that of the mother, so they won’t produce males. Some insects can do this too, which I only note because the Glasp obviously has some Insect DNA as well. So they have everything they could need to reproduce asexually. So there we have it, that’s how they can survive and reproduce. But let’s not stop here, let’s go and look at the offspring and how they work. Now there is only two ways to see the baby Glasp in Rev2. By getting killed by the adult which causes them to give birth on your corpse, and whenever we kill one with Natalia for the collectibles. Now the collectibles Natalia kills/collects calls the baby Glasp “Insect Larvae”, which is what you would call the offspring of insects, and we know the Glasp has insect DNA within it. The fact they are called larvae explains why the Glasp gives birth on freshly killed corpses, larvae are scavengers and can’t really go haunting for themselves and so the mother insures that they have a head start at survival by presenting them with food fresh from the womb, or whatever the equivalent is for a Glasp. Which is why we only see them when we get killed in the game. However these Glasp Larvae have to survive on their own and we also [kinda] see this in Rev2. When you are killing them for the collectibles as Natalia we see them hidden all over the pace by themselves and they’re invisible. While this is probably for simple gameplay, we can take this at face value and infer that they go off to be alone so they won’t be competing with their sisters for the little food they have available, as waiting for something to die would probably take a while considering the state of the island they’re on, assuming they only eat meat that is. As for why they’re invisible and not causing the effect the adults do, I assume its cause they’ve eaten whatever the mother provided for them, assuming my idea of how the gas is created is true, and at that age they can only produce enough to keep themselves safe. And that pretty much covers all there is, to my knowledge, about the Glasp and how they work. There’s just one more thing I like to point out. An afterthought that came to me as I wrote all this. Barry says the Glasp wasn’t mentioned in the brief and he didn’t warn ANY of the BSAA agents that get sent in to cleanup the island during the good ending, which means they don’t know about these bugs either. So ignoring the fact that some lives may be lost due to Barry not warning anyone about them, what would happen if one of those Larvae catch a ride back to the mainland? Lovely work on this and interesting viewpoints on the Glasp. Playing the game and seeing these things in action does cause you to wonder and you wrote out wonderfully on how these things could do the things they do and reproduce as well. They might return one day but we'll see. While I dont think we'll ever see them again, it would make for a good horror focus CGI movie, comic or manga to explore an outbreak of them in and around the Baltic Sea. They're annoying as hell to deal with in game, but it would make for a more tense visual experiance to watch people deal with them. Nice breakdown there. Aside from the Ultimania guide there is some information in one other guide. "A virus-mutated creature. The gas that emerges from its body interferes with the human optic nerve system and causes visual impairement. The space in front is distorted and figures can't be discerned." Compare the Glasp and The Reaper from Resident Evil 5's biographies and when it comes to the explanation of the gases they emit. They are very similar. Reaper Bio: "It can also secrete a gaseous chemical to affect an animal’s optic nerves and releases this gas to blind its prey’s eyes when close to it." They also both have hooks for hands. Perhaps this could go even further back to the Chimera and this is the evolutional advancement of that original BOW. 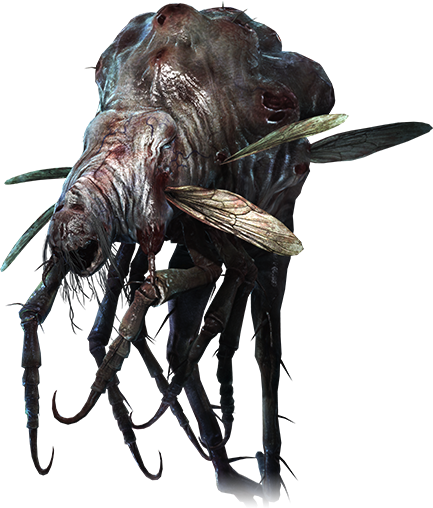 Also another close relation to the Glasp would be the Novistador from RE4. Both the Glasp and this BOW have the ability to camoflague themselves. Novistador had the ability to change it's color however and did not emit any gases but still similar abilities. As well as this Novistador could spew acidic stomach liquids over its prey much like the Glasp. Perhaps it is just lazy enemy design reusing similar type bug BOW's or is there further links with these bug BOW's and they are all related somehow by using their base when creating them. Thanks for the information! nothing like getting things accurate to the lore via simple guessing! I never noted those similarities between those BOWs before. That observation is enough for me to work on another potential theory for the future. Posts: 136 Nice, but I'd like to point out a few things. The enemies in Rev2 are actually extremely well thought out and detailed in general. The dogs you mentioned had their heads partially removed then forced back on so Alex could manipulate/monitor the spinal cord and see how they reacted to extreme stress. Once she was done with them, she shoved bear traps into their gaping neck holes to torment other fear test subjects. Alex was also obsessed with joining metal and flesh together. All the enemies in Rev2 are great, imo. As for the Glasps, look at their backs carefully and you'll notice they are actually based on human women. Their human faces, breasts and feet can be seen. The spores are where the belly used to be. The front slit from which they drop their young is actually the original spine, like the exposed backs of Afflicted. Try flipping them around in the in-game model viewer, and you'll see what I mean. They were created like the MA-120 Hunters were, splicing insect genes into human hosts and using t-Phobos as a retro-viral bonding vector. They are meant to resemble Gregor from Kafka's the Metamorphesis. Reapers are cockroaches infected with Uroboros, while Novistadors and Chimeras are also human/bug hybrids. Thanks for the additional info man. Its nice to hear that there's a reason for the metal and flesh being forced together. Makes me wish we could see how the Orthrus would function outside of gameplay limitations. I would love to see a pack of them left alone to evolve and reproduce. Be fascinating to see how they change and what the offspring would look like.